Today, BMW announced raising the jackpot to include the all-new 320i addition to the line along with a 320i xDrive model for the discerning driver who prefers all wheel drive. The two models have attractive base prices of $33,445 and $35,445 respectively, excluding destination charges of $895. For that small sum, you get BMW’s award-winning 2.0-liter TwinPower Turbo 4-cylinder engine, producing 180 horsepower at 5,000 rpm and 200 lb-ft of torque from 1,250 to 4,500 rpm. The newest model of the Ultimate Driving Machine can go from zero to 60 mph in an adequate 7.1 seconds with either transmission available. Though that’s not especially fast, the flip side is projected fuel efficiency of 22-mpg in town and 34-mpg on the open road with the 6-speed manual transmission. Models equipped with the 8-speed automatic should still get 22-mpg in the city and 33 on the freeway – top speed is electronically limited at 130 mph in both. Though not necessarily standard equipment, most of BMW’s ConnectedDrive elements and versatility options, shared with the BMW 328i and 335i siblings, will be available on the new 320i. These include, besides the 8-speed automatic transmission, BMW Assist telematics and services plus BMW Apps and BMW’s Navigation system. Other options range from heated seats front and rear, to a heated steering wheel, rear-view camera, adaptive xenon headlamps and moonroof. A Sport Package for either model includes 18-inch light-alloy wheels with summer tires and an increased top speed limit, sport seats, M sport suspension, M steering wheel and anthracite headliner. All-season tires with the standard speed limiter can be selected in place of performance tires. Other option packages available for the 320i Sedan include Cold Weather, Premium, Driver Assistance and Lighting Packages. BMW’s innovative 8-speed compact gearbox is exceptionally efficient, allowing the vehicle to equal or outperform the fuel efficiency of the standard six-speed, depending on driving style The new automatic combines comfort, dynamic performance and high efficiency complimenting the new 320i sedan’s dynamic potential. BMW achieves remarkable fuel economy thanks to EfficientDynamics technology that includes Auto Start-Stop, Brake Energy Regeneration, and on demand operation of ancillary components, including the air conditioning compressor. Driving Dynamics Control allows the conscientious driver to choose from Comfort, Sport, and ECO PRO modes, increasing the potential economy individuals can cultivate. The hallmark of BMW has always been sporty performance and now the brand is beginning to add a new level of comfort to the mix, without compromising the unerring dedication to high-performance engines, a sporting chassis plus a rigid, yet lightweight body. The longitudinally mounted engine in the rear-wheel drive vehicle achieves an almost perfectly balanced 50/50 weight distribution in the BMW 3 Series, the leading sports sedan in the segment. In addition to the twin turbo 4-cylinder, an inline 6-cylinder engine that also features TwinPower Turbo technology will be offered in the new models. Both engines offer characteristic BMW driving dynamics along with substantially reduced fuel consumption and emissions, with both engines well within the US ULEV II limits. Advanced suspension technology utilizes numerous light-alloy components that have been tuned to Servotronic speed-sensitive power steering. The 320i’s low vehicle weight and balanced center of gravity create a dynamic experience, engendering a new level of rapport between man or woman and machine. The new lightweight 2.0-liter engine marks a return to the halcyon days of the sports sedan’s early roots. 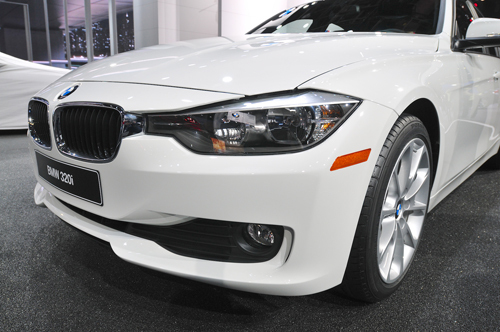 When the BMW 3 Series made its debut back in 1975, it featured a high-performance 4-cylinder engine. The first 6-cylinder engines in the series didn’t debut until the 1977 Frankfurt Motor Show. Today, 6-cylinder engines continue in the line-up on the 335i, 335i xDrive and ActiveHybrid3 models. BMW TwinPower Turbo technology uses High Precision Direct Petrol Injection, Double-Vanos variable camshaft timing and Valvetronic variable valve timing along with twin-scroll turbo charging to seriously boost the output of the engines. Higher output engines replace increased motor displacement, along with the lower efficiency born of excess weight, consequently explaining how more dynamic performance does not come with a cost in higher fuel consumption and emissions. To get the same output out of a naturally aspirated engine requires more cylinders and a correspondingly larger displacement. Further, an all-aluminum crankcase makes for a lighter, more compact engine of equivalent power, resulting in a reduced load on the front axle to generate greater agility and further improve steering and cornering characteristics, all enhanced by the vehicle’s superior balance. Valvetronic variable valve timing and Double-Vanos variable camshaft timing combine to produce high power output with a simultaneous reduction in emissions. The latest generation of the Valvetronic system uses a faster-acting, optimized stepper motor and integrated sensor, thus achieving seamlessly variable intake valve lift control without a throttle butterfly. The air is controlled within the engine, resulting in quicker response, while pumping losses have been minimized. The High Precision Direct Injection system is positioned centrally between the valves, while solenoid injectors control the supply of fuel precisely. It is injected very close to the spark plug, at up to 2900 psi, resulting in clean and thorough combustion. The cooling effect of the injected fuel creates a higher compression ratio compared to port injection engines, adding to efficiency. The high performance of the engine also evolves from various innovative features of its core. The twin balancer shafts are positioned at different levels resulting in the dampening of vibration, while a centrifugal pendulum in the dual-mass flywheel reduces irregular running at low engine rpm. This generates smooth, strong low-end torque and gives the new 4-cylinder engine refinement via low noise and vibration, attributes previously limited to BMW 6-cylinder engines. For stick jockeys, the sporty 6-speed manual transmission in the 320i delivers easy, precision shifting and optimal ratio spacing. A lightweight, compact format and innovative, low-friction design combine to enhance the feel and efficiency of the shifter. The transmission is optimized with ratios precisely matching the performance characteristics of the powerplant, to deliver powerful sprinting and fast mid-range acceleration, while gently sipping fuel. The sixth generation of the BMW 3 Series rests on a firm foundation, with a precision-engineered chassis mating four-wheel independent suspension to the longitudinally mounted front engine with rear-wheel drive. Add balanced weight distribution and a rigid body to produce a new level of agility and directional stability, not to mention additional insulation from the imperfections of the road. State-of-the-art electronic control systems insure peace of mind by overseeing vehicle dynamics, allowing guilt-free enjoyment of the exhilarating performance of 3 Series models. With friction-reduced wheel bearings and ball joints, plus aerodynamic upgrades at the rear axle and reduced resistance tires, the chassis plays a big part in reducing fuel consumption and emissions. The new vehicles adopt innovative but proven front axle design to seamlessly blend driving dynamics and comfort, while suspension components combine maximum stiffness with minimum weight. Aluminum torque struts, wishbones and swivel bearings greatly reduce unstrung masses, while the absence of torque steer makes it easier to gear the kinematics of the double-joint axle to agile dynamics. Incorporating various refinements, the rear axle of the BMW 3 Series makes its contribution to improved driving dynamics as well. The reliable five-link design previously used, along with specially tailored elastokinematics, feature long spring travel and precise wheel location in all situations. Other aspects include extra-wide mounts and supports on the wheel carriers for track and camber, plus extremely stiff control arms, a rigid axle subframe and thrust arms that connect the suspension to the body, together providing the basis for an agile, comfortable suspension. The oversize mounts and supports in the rear axle assembly ensure acoustic insulation from the powertrain, as well as enhancing control. Dynamic performance demands powerful braking, so there are lightweight floating caliper brakes at each corner with large vented discs capable of outstanding heat tolerance, excellent wet braking and precise control. The large wheels and wide tires conspire to implement highly effective deceleration. Of course, all of the latest braking, traction and stability systems are right on hand to ensure the new BMW 320i and 320i xDrive are on the cutting edge of safety technology. Despite the level of safety, performance and control residing in the new vehicles, in the unlikely event a collision occurs, the enhanced Automatic Collision Notification system, part of BMW ConnectedDrive, provides emergency services with prurient information on the collision and the possibility of injuries requiring trauma care. First responders arrive prepared to treat those involved, with precise vehicle positioning, model and make specified, plus data gathered by in-car sensors. The system even identifies which side of the vehicle was impacted, informing paramedics of how many patients and what type of injuries to expect. This results from an advanced algorithm developed in partnership with the William Lehmann Trauma Center in Miami FL. A driver or front passenger can also make the Emergency Call manually being connected with the BMW call center immediately. The new BMW 320i and 320i xDrive will be in showrooms during late spring this year.